Start with the scariest subject first. Let us begin with a brief explanation of the Black Lantern. 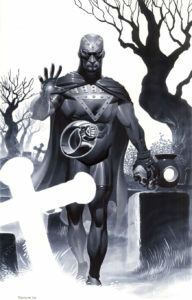 It originates with the story line done by Geoff Johns entitled Blackest Night. In this story arc, there is a prophecy of a war of the light. 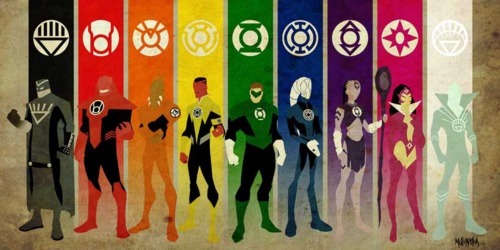 The emotional spectrum will break out from just the green and yellow lantern and spread across the universe. This will signal the arrival of the darkest night. What this is, the guardians do not know but strive to prevent. The Blackest Night is the rise of the Black Lanterns which represent death. The rings search out the dead and resurrect them to spread death and despair throughout the universe. This is all orchestrated by the demon, Neron. He grew tired of the heroes of the universe constantly cheating death and created an army to correct this mistake. His army was spearheaded by Blackhand, the Nihilist of the DC Universe. Johns was tapping into both comic tropes and Freudian psychology with this story. Freud and several of his adherents posited that there was both a life force and death force that drove human behavior. These two competing drives combined with the components of the psyche to fuel a person’s striving in one direction or another. Johns also tapped into the idea of the returning hero making it the motivation behind Nero’s unleashing of the black rings upon the universe. The problem with the Black Lantern as a starting point is that the subject of self-harm, suicide, suicidal ideation, and self-destructive behavior are taboo subjects. To discuss them opens one up to ridicule and stigma. This is inappropriate and leaves people that may be on the edge in this arena with nowhere to turn. This exacerbates the problem. The issues that are contributing to these thoughts and feelings push people from the grey that is the world to where things are cast in stark blacks and whites. They no longer see a way of reaching out of the black and getting to some state of calm or lessening of pain. I am one person, and I can not change the way of the world. What I can do is stand up say that it is okay to talk about these things and be role model for people who may be struggling with these issues as well as those that love them by sharing my story. Way back in 2012, I talked about my own self-loathing, poor body image, and all encompassing loneliness. These things were very much rooted in my past. I had been born with many birth defects which required surgeries up until I was 21 to fully correct. This built up within me this self concept of being a mistake and something less than human. It would take years to realize that layered within that was the additional self hatred of being gay. In 2012, I took that step to admit to myself and then later to others I was gay. It then allowed me to begin working on those deep seated issues of feeling flawed and unlovable. This process of reconstruction is never ending. The ideas about yourself that a person builds up over the year have inertia on their side. The effort to move them can seem herculean. When the work begins, you quickly realize that you are going to run out of energy long before you are at something you are going to call acceptable. For me recently, this was in February. I lost sight of a lot of things during this month. I had been pushing pretty hard on getting outside of my comfort zone. I am a shy person and not very good at this meeting people thing either. I had begun going out to Bear Dinners here in my home town. In addition, I had been lucky to make friends at these events and was invited to parties and other gatherings. It was super great and I was non-stop pushing forward on things for me that had been fallow for such a long time. This is where the forgetting begins. I mentioned I am shy but I am also an introvert. It takes immense energy for me to do these things. I was bound and determined that I wasn’t going to stop. It was as if a desperate drive had taken over. This was what I wanted and if I stopped now I would lose all progress. Life is Nintendo hard you know. This progress was not without failures and struggles. Actually, there were lots of both as I had few skills in the relationship building arena outside of clinical ones. So every three steps forward were accompanied with one or two back. I would attempt to retreat and to recover and feel that fear of loneliness and loss and hop right back in without having recovered. February turned into the perfect storm. I did several big things that I had not done and the failures were spectacular and public. These combined with other life events to push me near the black. To steal from Taken, I have a particular set of skills. Even when in crisis, I am assessing both myself and others. I was concerned with the point that I had reached and took action. I was quiet about it as that fear of stigma for asking for help. I didn’t tell anyone in meat space what was going on. I just made sure to keep people with me that cared. People want to believe it is easy not to slip into these self-destructive patterns. It is a convenient fiction that we tell our self so that we feel better. The thing is that it is very easy to slip into the this space, more so for those of us in the LGBT community. Not only do we face discrimination and hatred from without, we have to some degree incorporated this loathing into ourselves and it just intensifies these feelings. Knowing it is okay to talk about this stuff is a small step. This small step could keep someone from picking up that black ring when the white one seems so far away. Take time to check on your friends and loved ones. You may not notice that they have slipped into the black, but that kindness may be the lifeline that pulls them back. It has been a long time since I’ve written about myself. I was looking back at one of my old blogs and realized that It was way back in 2012 when I was just beginning the process of coming out that I had stopped writing about me. I had used as framework for my musings, The Emotional Spectrum. For those not in the know, I am referring to the different Lantern Rings from DC Comics. 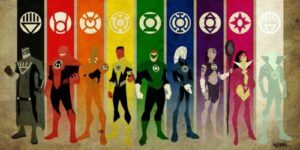 It started with the Green Lantern which represented willpower. As the storyline progressed other colors on the rainbow were added. It started with Yellow and fear and later Violet representing love. It was leading up to Darkest Night that the spectrum expanded to include all the colors of the rainbow as well as white and black. I will freely admit that it is a simplistic approach to emotions and yet it resonates with me. The idea that emotions can be weaponized and harnessed for good or ill is both literal and figurative. You can see in everyday interactions how emotions are manipulated by others to gain advantage and leverage against others. The stories that are possible within this idea are also limitless. Which always leaves me a bit disappointed in DC and it’s handling of the Emotional Spectrum as they take no risks and tend to leave everything in the hands of the old tried and true without tapping the depths that can be found in this idea. so, I will put fingers to keyboard and talk a bit about where I am today and what I am doing to push forward. It will be centered around each of the Lantern Rings and I will not shy away from the Black or the Red. If you would like to see my first crack at it, you can find it here. Start at the Emotional Spectrum and work your way up. All of these things are the siren song of the geek. Before I came out, I spent time on the internet perusing the different communities and was very happy when I discovered Bears. Here was a group that originated in the IT sector before it was even a big thing. They were of the same body type as me and seemed to have a large amount of members that enjoyed geeky things like I did. The more reading I did, the more the idea of Bear Brotherhood kept cropping up. this was the idea that this community was open and accepting of all those that called it home. This community would provide a place that provide a welcome to those who did not fit what, at the time, was the standard of gay male beauty. Everyone wants to feel accepted and that they have a place where they fit in. This is an important concept with incredible power. The idea of Bear Brotherhood makes sense. 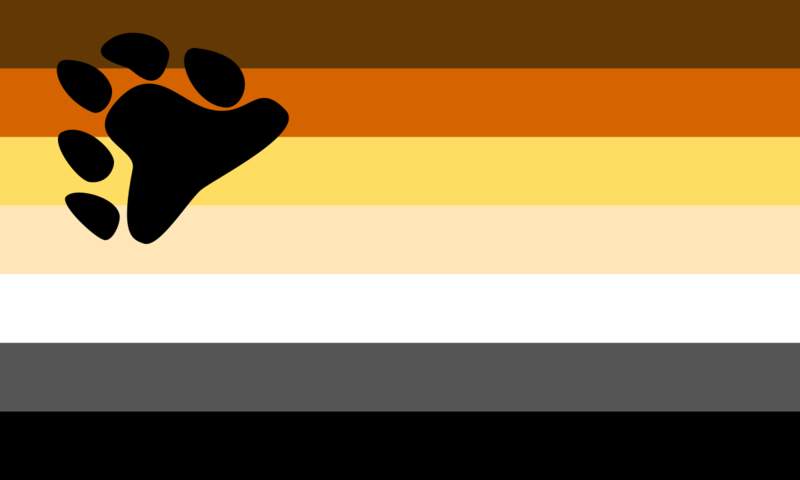 It paints the bear community as empathic and accepting and is used as a means of bringing people together. Having a community that, on the face of it, is accepting of all members and provides a safe place for people to come together and find acceptance is admirable. When this happens, we bears will experience a connection with other bears that is enriching both on an emotional and physical level. This concept is made manifest in the bear community both online and in events such as Bear Runs, Bear Dinners, Movie Bear groups, and any of the myriad bear gatherings that exist across the face of the planet. Each is designed to reach out to members of the Bear community based on a range of commonalities. They exist to encourage and enhance Bear Brotherhood. It is in this expression that the power of Bear Brotherhood is experienced in it’s myriad forms. The things that people either forget or gloss over is that the expression of an ideal is always mitigated by the group dynamic as well as the desires of the more powerful personalities present. You organize a get together where the objective is for bears to come together around a central theme and feel comfortable. If the majority of the people who show up are there to find someone to hook up with, the idea of Bear Brotherhood is an elusive beast to capture. Notice, I did not say absent. If you are an outgoing or popular bear, you will be able to find this type of connection even at events where the group dynamic is about hooking up. It is the shy and less popular bears that will have a much harder time in this environment. They have came to meet new people and feel accepted. Where they came expecting to feel welcome and accepted, they end up facing the same feeling they would get if they went to a bar. They will attempt to make conversation and the frustration and fear will build as the absence of community is quickly felt. This idea of community is also utilized in a manipulative fashion. The aforementioned hijacked event for the purpose of hooking up is just one. If you’ve attended a bear event that has a charitable aspect to it, then you’ve seen the manipulative aspect in full force. These events tend to have cute volunteers whose job it is to go around and sell raffle tickets or some other means of generating revenue for said charity. There are those that are straight forward and tell you they are collecting for charity. There are also those who leverage that sense of community and create that feeling of belonging in order to get the money flowing. I am not saying this is wrong as it is a standard sales tactic. It is just problematic as those shy bears whom have shown up to feel like they are part of something will come into this interaction with a very different perspective and are at the minimum going to feel let down when they realize their perceptions and reality do not mesh. I know that I am coming across a bit harsh on the idea of Bear Brotherhood and community. I am pointing out the flaws and leaving off that feeling of that one does get when that connection happens. I am a firm believer in the ideal of Bear Brotherhood. It is important that we make all bears feel welcome and like they belong. We live in a world where we aren’t accepted and there are those that constantly strive to not only marginalize us but to even destroy us. That we have a strong, supportive community is something that does matter. I think that is why it is important to take a look at the community that we participate in and have created with a critical eye. By doing this, we can create a better place for us. It doesn’t take much effort to take a good community and make it great. If you look at yourself and those around you and ask a simple question, “What am I missing?” Then you take that step back and you might notice that person sitting at the edge of the group that has felt the vibe not being conducive to just having conversation. You might notice that person treading water at the deep end of the pool at a bear run and wander over and ask, ” How is your run going so far?” It is a platitude, but small steps are needed to complete any long journey. So do me a favor bears. Keep believing in the idea of Bear Brotherhood. But, always take the time to step back and look at the community or event you are at. Look at it critically and see where it might be failing someone. When you see this flaw, step and do something about it. If we don’t create and support a community that lifts up all of us, who will? This is the perfect spot. This park, though in the heart of suburbia, was designed to take in the sunset framed over a dogleg in the river. Two majestic oaks, hundreds of years old have been pruned and prodded to create a natural proscenium arch. It sets the stage for an act that is unbeatable this time of year, a summer sunset. The sunset paints the sky with a shades of red, orange, and yellow. The heat lingering on the earth as the great burning eye descends behind the horizon to abdicate the sky to those lesser lights. The sunset is gorgeous and yet is not what draws me to this park each month. It is these lesser lights that will soon grace the dome of the heavens that draws me to this place at this time each month. The light begins to fade first. The streetlights begin to buzz and slowly awaken. The lightening bugs, as if to protest the dying of the light, begin winking their lascivious lights into the night. The night blooming flowers strewn along the fences that line the edge of the park near the river’s edge begin to yawn and stretch their petals. The colors begin to fade from the sky as the inky darkness rises to claim the night from the iron fist of sol invictus. The sounds of the insects and birds change their tenor. The sweet songbirds that graced the day time skies are snuggled down in their nests. The night birds take wings and their somber coos and hoots fill the void of the night. The crickets chirp as they begin their nightly rounds and the moths flutter to the points of light that create their own tiny globes out of the void. I sit on my bench. The sounds and sights of the twilight wash over me. The heat of the day is the last to surrender to the night. It clings to every inch of the park like a lost lover that will never see their paramour again. This last caress must be savored and stored away against the despair of lonely nights to come. This is why I come to this place at this time each month. I come to remember that I am not trapped. I am not a slave. Watching the fading of the light and the people wending their way through the park as the night embraces the earth. I hear all the noises that permeate the park. From the lap of the river at the parks edge to the giggle of the teenagers fumbling in the bushes. The scents of the are carried to my on summer’s zephyr breeze. The sweet scent of evening primrose, and Jasmine. The acrid smell of exhaust and rotting trash. All of these crowd my consciousness to let me know that the darkness draws nigh and that I should be afraid. I shiver as full night takes hold. The lessons that have been beaten into cry out for me to run home and lock myself indoors. The night brings nothing but sorrow and pain. The darkness harbors malicious intent that it wields with frightful abandon. Four beats in, four beats out. Mother night wraps her arms about me as full dark claims the land. The twinkling of stars and the street lamps the only illumination. The baleful eye of sol’s sister does not grace the vault of the sky this evening. With her absence, I am free! The last red haze that tinged my consciousness slides away. The buzz of anger and rage fades away on the sounds of a night hunting bird. The tension in my body slowly drains into the bench and down to the earth’s waiting arms. They say to cower away from the night, to shun the darkness. The darkness devours your intellect and humanity leaving nothing but a husk. They never change and never risk the darkness to see what life might be like if risks are taken. They call me freak and abomination because I risk the night. I know the secret though. Night is not the jailer nor the prison. It is but the vehicle by which this rage is driven. Selene, with her silver chains, enslaves us. Drives the beast to rage. The secret is to witness this twilight, this time each month. Be washed in the inky blackness of a night with out the moon and drink in the light of the stars. Step out without fear of the night and embrace the silent songs of the stars as they lift up one’s mind out of the pain of the nights too come. I have taken the risk and been richly reward. This night, this perfect night belongs to me. I change and their is no pain. I change and their is no rage. There is only me and the beast as one. Tonight I run by the light of the stars alone. I run and nothing has to die for me to stop. And for a little while, the stars alone set me free. If you’ve read some of my posts, you will know that I enjoy reading comic books. I look forward to new comic book day and seeing what has shown up in my pull list and what interesting titles may be lurking on the shelves at my local comic shop. The thing is, I am a reader of comics, not a collector. This presents me with several issues which I ponder at length. These issues all fall neatly into the larger consideration of digital versus hard copy. Digital makes the most sense when viewed from the logical perspective. First there is the storage issue. As I am not a collector, I do not have long boxes to keep my comics in. I do not bag and board my comics either. I pick them up from my local shop and read them. After being read, they sit in a pile in my home getting in the way. Digital comics would eliminate this problem completely. I would be able to store the comics I bought in the cloud and have nothing cluttering up my house. Next there is the convenience factor. On new comic book day, I could get out of bed and tap on my iPad and have my comics that I get each week purchased in a matter of a few minutes. Even if I am unable to do it within the comixology App, the website is pretty intuitive and makes the purchase simple and easy. There isn’t the worry of getting to the shop before it closes. Finally, there is the guided view that comes with most items purchased online. The digital version of a book allows you to follow the story in a different manner. As the name implies, it guides the the from image to image in a fashion much different than what I normally do when reading a comic. It provides a different perspective on the issue which is enjoyable. Despite all this, I still buy the physical copies of the comics I read. One of the biggest reasons I do this is to support local shops. It sounds altruistic but it isn’t. In my area, finding people that liked comics, games, and other nerdy things was not easy. The fastest way to find those that shared similar hobbies was going to my local comic book store. I would be able to get my comics, find the newest roleplaying game, and talk about all of these things with other people at the store. I want this type of environment to be around for future generations that are into comics. So, will support a local comic shop that I believe in with my money and my time. As much as the digital versions of comics are more convenient, I enjoy both the physical artifact of a comic book as well as just browsing the shelves to see what else might be interesting. There are hardback collections of titles that I enjoy that are gorgeous. I may see a picture of them online, but picking them up in the store and appreciating their sheer beauty is something altogether different. I have also recently been to the comic book store with friends. Walking around with them as they pick up their books and having them make suggestions of books for me to try was moving for me. It took an experience that has normally been solitary and made it all the better. I also like having someone to talk to about what I am buying at the time of purchase. I have found out about titles that I have enjoyed being cancelled from my local comic shop. I have also been given recommendations of titles that are similar to what I normally buy that have turned into some of my favorite books at the moment. The computer does this but I have yet to have any luck with the algorithm actually picking anything that I enjoy. It’s funny. I am a shy person but I enjoy the human interaction around the things that I enjoy. Talking to the people at my local comic shop makes my day even when I might not be up to full on interactions. Finally, despite always having a pile of books that I have read, I don’t mind. Like i said, I am not a collector. I will take the pile to my game night or to a friend’s house and let them go through the books that I have and take what they like. I let them see if there is anything that I enjoy that they might like and give it a try. It makes it easier for them to get into this hobby I enjoy and I spread a bit of joy when I do this. How do you buy your comics? Why do you chose to buy them in that fashion? In the past few months, I have been one of the ten thousand a lot. One of the things of which I was ignorant was Welcome to Night Vale. My tastes in science fiction and fantasy tend to run towards the more mainstream variety. Mythology being the dominant theme that occupies most of the media that I consume. I love things that are quirky but they have to brought to my attention if they fall outside of my sometimes limited vision. Welcome to Night Vale is just such a quirky podcast that straddles many genres and does it with a style and grace that is just breathtaking. The show takes the cosmic horrors that populate the writings of H P Lovecraft and August Derleth and blends them with the existential horrors that populate the lives of those of us living the life suburban. A good example of this is when the radio show speaks of the local bowling alley. The audience will be informed of the ancient city that has been discovered in a hole by the pin setter. The discovery prompted by the loss of a bowling ball falling into the depths of the city and the noise it makes echoing across the vast halls. The narrative then quickly swings to the mundane as the owner asks that people getting their bowling shoes know their size so that this part of the process could go quicker. Welcome to Night Vale embraces the idea of the uncaring universe and shows the perseverance of human nature as it’s citizens try to continue on with their lives despite knowledge of their small place in the vast cosmos. 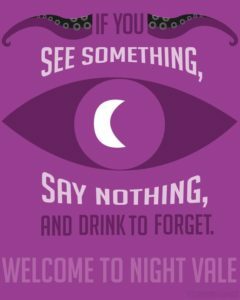 There is so much to love about Welcome to Night Vale. There are certain things that provide anchors for me to the show that I wanted to point out in particular. First, There is Cecil, The Voice of Night Vale. He is our window onto Night Vale and the host of the radio show to which we are listening. He tells us of the community radio station for which he works as well as about the people that live in the town. He is the human connection to this strange place that is nestled somewhere in the deserts of America. As the show progress he provides us personal asides both in context to the stories that he presents as a journalist and out of context as a member of the community of Night Vale. A perfect example of this is Steve Carlsberg. There are points where things are going wrong and Cecil will become distracted by something small going wrong in the community and will blame Steve. He will go on, at length, how Steve is the one to blame for not doing things the way they are supposed to be done. Cecil is also an unreliable narrator. He is our human connection to all this weirdness. As we listen, he paints us a picture of a place that is in turns, weird, wondrous, and prosaic. He tells us stories of the people, the culture, and the government of Night Vale. All these things bring us, the listeners, into his circle of trust. As we listen, it quickly becomes obvious that Cecil is not giving us the whole story. Not out of maliciousness, but due to the very nature of Night Vale itself. There are points where he points out that writing utensils are illegal as are books and yet he has attended school and has taken notes on stories that he reports on. Combine this with frailty of the human mind when confronted with the immense powers of things like the Glow Cloud. It comes to town and we are given ongoing reporting on the crisis. At the peak of the crisis, Cecil reports that the denizens of Night Vale have begun worshipping the Glow Cloud and then begins worshipping as well. When we return to Cecil in a non-worship mode, we learn that he has no memory of the past time period and that all recordings of what has happened are blank. Did what we just here about the community really happen or were the stories that we listened to during the episode just fabrications of the Glow Cloud? I also love that despite the horror and absurdity that are part and parcel of Night Vale, the core of humanity is never lost. It embraces the dichotomy of humanity and shows the listener the heights to which humans can reach and the lows to which they can descend. It does this by illustrating that Night Vale is a small insular town and yet embraces diversity. Cecil provides the best example of this. From the first episode, we get to watch as Cecil falls in love. A scientist, Carlos comes to town to investigate the oddities inherent in Night Vale. We get to listen as Cecil waxes poetic in his descriptions of Carlos whenever he enters the narrative. 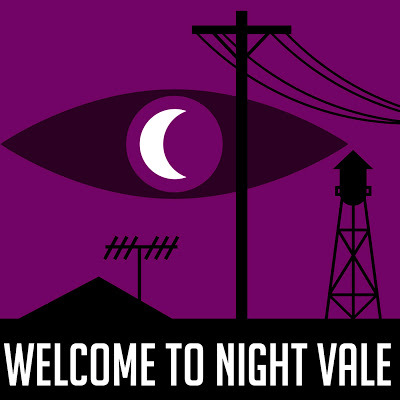 Welcome to Night Vale is a community radio program and we get to listen as Cecil goes from a crush on a handsome scientist to dating him and this is perfectly acceptable by community standards. For me, this was a standout and something that drew me in quickly as this was a place that was weird but accepting. But the show also doesn’t allow you view the citizens as fine upstanding people though. It takes the time to show them as insular and fearful of change as are most humans as well. There is an episode about a traveling carnival. As the story progresses, we are set up to see this thing as some traveling evil that has come to prey on the city. The build up is similar to the movie, Something Wicked This Way Comes. At the climax, we watch as the people of Night Vale unite to drive out the interlopers. As they flee, we get to see that it was just a regular carnival and that Cecil and the people of Night Vale have given into to fear of Strangers and done something horrible as the carnies flee for their lives from the hatred of these people whom have become as monstrous as some of the threats that they have faced. 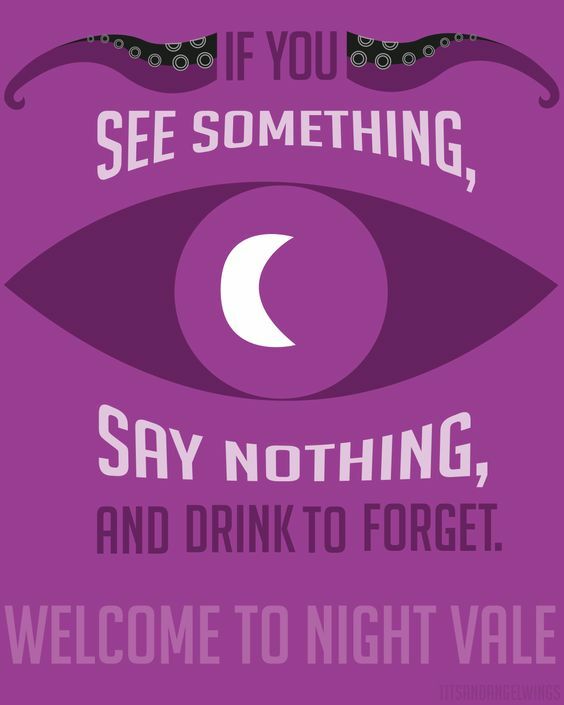 I am so glad that I was introduced to Welcome to Night Vale. It brings me into a weird, funny, and scary world that is welcoming and terrifying in turns. The storytelling is so engrossing that I look forward to each new episode to see what little piece from prior stories will crop up and become the next big bad. This show also has a penchant for punching you in the feels with no warning and this something that elevates this from entertainment to art in my mind. If you have not listened to Welcome to Night Vale, you should remedy this egregious error quickly. Four Bear Paws out of four. I bearly recommend Welcome to Night Vale! You may have noticed from previous posts that I have a thing for mythology. Tales of the gods and their progeny fascinate me and will always garner my attention. It was this love of mythology that attracted me to Neil Gaiman’s American Gods. I had loved his work on Sandman and him playing with myth in the modern era was enough to entice me to read the book. 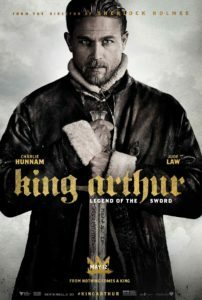 When I heard that they would be doing a comic adaptation of the book, I was excited. The first issue came out last week and I snatched it up as soon as I saw it. I did not get time to read it until over the weekend. I read the issue twice in one sitting. The first reading was filled with that giddy excitement of getting something you’ve been waiting for. The second was to fully process what I read. 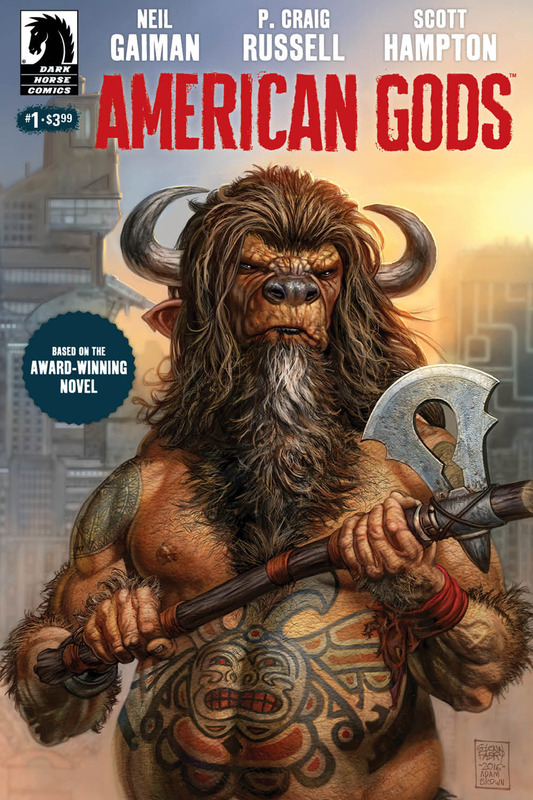 After processing, I have to say that the first issue of American Gods is Meh. It feels like sacrilege to say a comic by Neil Gaiman is just Meh! I have read this story before, several times to be exact. I am familiar with the rhythm of the narrative and flow of characters. I have images in my head that I have conjured in these many readings. This leaves a comic a very high bar to achieve. This first issue, as one would expect, tackles the opening of the book. Literally. We follow the beginning in an almost reverent fashion. The panels tell us the story of Shadow and his Campbellian call to the post of the hero. This issue picks up on the languid pace that the book always seemed to have in my mind and stretches that across these pages as well. I know this story. I know the cadence that it begins. The slow drum beat that builds and builds over so many pages. 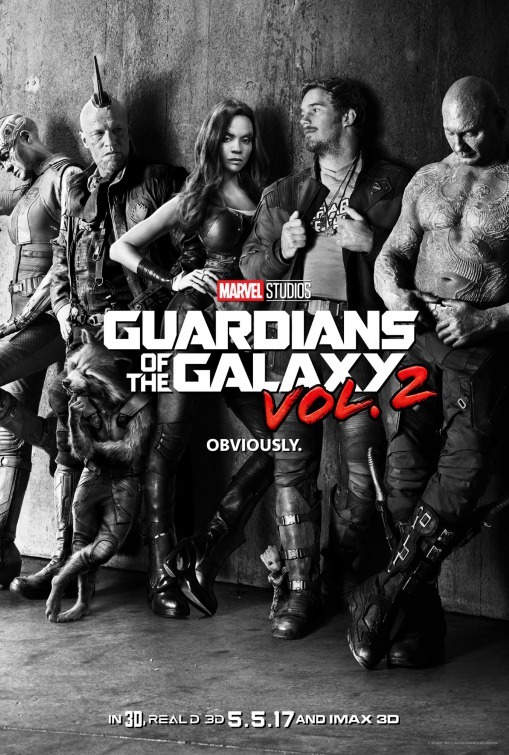 I enjoyed it in novel form but it seems laboriously slow in comic form. Instead of getting lost in the prose, I felt like the story dragged moving from panel to panel. The bits and pieces of the story that kept me rapt were built into the descriptions in the prose and are lost in comic form as they are just backgrounds. The art is my second stumbling block. Like I mentioned, the descriptions in the book add more to the narrative than detract and brought you into the story. These pieces are given little attention in this issue. The art style is reminiscent of Breaking Bad. 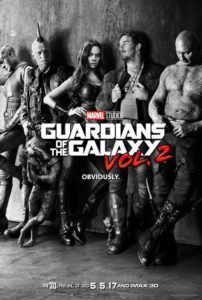 It has a gritty and half formed feel that just grates on me. It is well done done but just does not work for me. Overall, I was disappointed in this issue. I was expecting a more dynamic retelling of the story and what I am getting is the story just retold. The art style leaves me cold and I miss the tiny bits that stood out in the prose that are glossed over in the comic. I am going to give issue no 2 a try but I am not holding out hope. I would give American Gods No 1 two bear paws out of four. It is a retelling of a story I already know without adding anything new. The art is good but of a style that just grates on me. 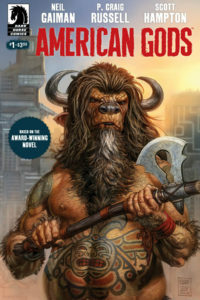 If you are new to American Gods or must have everything by Gaiman, pick up american Gods No 1. Otherwise, wait for the trade. My taste in comics can be described as vanilla. My fandom runs the regular superhero circuit with a few forays into the independent arena with titles like East of West or Thief of Thieves. My exposure to companies other than Marvel, DC, and Image is also limited as Valiant has been the only new company added to my pull list in a long while. Luckily I have friends that also read comics and have decided that my horizons need to be broadened. I went out to my friend Stick Pup’s local comic shop to check it out. My habit is to always buy something at a local shop if I visit to show support for the people in my fandom in the area. I picked up several Rick and Morty trade paperbacks and some Star Wars comics for a friend. While looking around, Stick Pup began adding things to my pile. The list is a bit extensive and I am slowly plowing through it. The piece that stood out for me was Animosity from Boom Studios. The trade for volume one was gorgeous. The cover, as it should, arrested my eye. It is a picture of a little girl with a rifle on her back, her loyal dog by her side. Standing outside the light, the shadowed faces and glowing eyes of wolves can be seen looking on. I was sold from this image and it was the first thing I read from the pile when I had the chance. 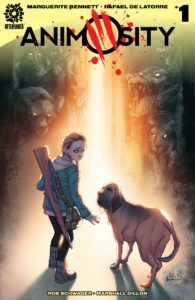 The premise behind Animosity is that one day, all the animals on the planet woke up. Not in that they were asleep but that they were not conscious in the way that humans are. The story then spools out from there. The animals gain not only consciousness but understanding as the world is not suddenly filled with billions of two year olds. The animals just awaken, as if from a dream. For the most part, these new sentients have the cognitive capacity of an adult with exceptions just like humans. The results are spectacular. I love the story that Bennett has created. she creates a world where instead of the animals becoming another zombie plague, they become people just like us. They have their own motivations, their own capabilities and biases. She highlights these individual quirks throughout the story with little scenes illustrating how the animals dealing both with their relationships with humans and other animals. In particular, the first few pages we get to see as animals wake up in various situations. There is a recurring panel where there is a family at the vet with their god, obviously struggling with the decision to put him down. The next panel we are shown the dog telling them “Don’t cry. I understand…I forgive you.” Gut punch! On the flip side there is a series of panels with cute pandas being cared for. The tilt happens and they have grabbed guns and are committing suicide crying, “Why did you keep us alive for so long?” Another gut punch. These vignettes serve as a backdrop to the journey of Jesse and Sandor, an 11 year old girl and her loving dog. WE get to see how the family survives the early days of the awakening and how the two then survive after things go south. Bennett takes the faithful dog trope and turns it on it’s ear as everything in the world goes sideways and that loyalty and caring are tested in ways that are sometimes difficult to watch. I talk about the story but the art is stupendous on this book as well. The panels I mention earlier are all small squares, part of a larger page. But each one captures the tone and emotions and conveys it unmistakably.De LaTorre has way of capturing complex scenes and communicate the myriad emotions with aplomb. He takes the depth of the story that Bennett has crafted and renders it lovingly on the page. I could rave about this book a lot but I don’t want to spoil it. Bennett has crafted a world that I want to know more about. I devoured this story quickly and am waiting for more. The art lives up to the standard that the story sets and leaves nothing behind. My one caveat is that if you are soft hearted where it comes to animals, then this may not be the book for you. The violence can be brutal and heart-wrenching. This is a four bear paws out of four book. You should definitely pick up the trade and add the second series to your pull list. I am looking forward to seeing more of the Journey of Jesse and Sandor and those that they pick up along the way. I bearly recommend this book!